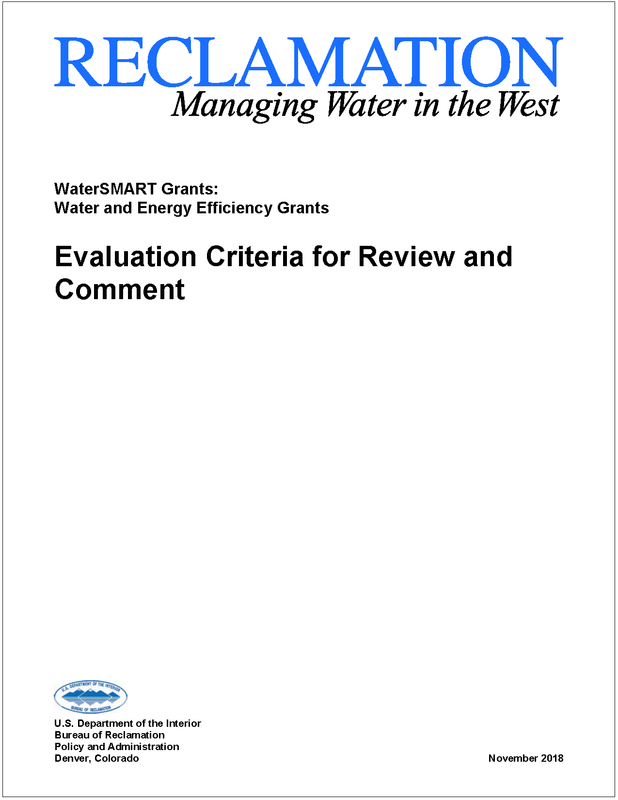 The document with the evaluation criteria that is available for review and comment.WASHINGTON – The Bureau of Reclamation is seeking comments on updated evaluation criteria for the WaterSMART Water and Energy Efficiency Grant funding opportunity. The updated evaluation criteria will be used in the 2019 funding opportunity. It can be found at https://www.usbr.gov/watersmart/weeg/. Water and energy efficiency grants focus on projects that conserve and use water more efficiently. Projects may also mitigate conflict risk in areas at a high risk of future water conflict and accomplish other benefits that contribute to water supply reliability in the western United States. Other projects complement on-farm improvements that can be carried out with the assistance of the U.S. Department of Agriculture’s Natural Resources Conservation Service to accomplish coordinated water conservation improvements. Comments are due by Dec. 20, 2018 to Joshua German at jgerman@usbr.gov.